You can be a palpitating force, a veritable human dynamo, or you can be a half-alive mass of human flesh—not unlike the jelly-fish. It is the quality of your blood that determines entirely to which class you belong. Eating without appetite means devitalized blood. The stomach is not ready to digest food at such times. It is appetite — a strong craving for food—which definitely indicates that the stomach is ready for digestion. The food eaten is then keenly enjoyed. The pleasure in eating serves a very valuable purpose. It not only causes an unusual activity of the salivary glands, but also of the glands of the stomach. So that when the food arrives in this organ, digestion and assimilation progress rapidly and satisfactorily. Now when you eat without appetite, these invaluable functional processes are inactive or entirely absent and the food can do nothing but lie like lead in the stomach. You say it won’t digest. Why should it? No self-respecting stomach will allow itself to be outraged in this manner, without protest. Eat at meal time if you are hungry, but if the food has no taste respect the mandates of your stomach and wait until the next meal or until your appetite appears, even if it takes several meals or several days. The “eat-to-keep-up-your-strength” idea that has been advocated for generations by allopathic physicians, has sent, literally, millions of people to premature graves. Even a person in good health can miss one meal or fifty meals, for that matter, without serious results. But abstinence of some sort is absolutely essential if appetite is missing; and is especially necessary in many illnesses. There is no sauce better than hunger; and there can be no health of a superior sort, unless food is eaten with enjoyment. When you eat a meal with what is known as a “coming appetite” you are often treading on dangerous ground. 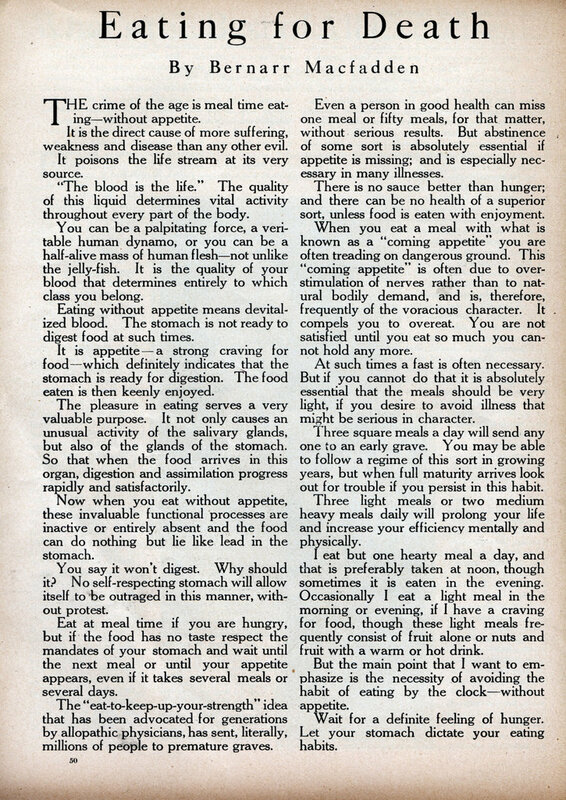 This “coming appetite” is often due to overstimulation of nerves rather than to natural bodily demand, and is, therefore, frequently of the voracious character. It . compels you to overeat. You are not satisfied until you eat so much you cannot hold any more. At such times a fast is often necessary. But if you cannot do that it is absolutely essential that the meals should be very light, if you desire to avoid illness that might be serious in character. Three square meals a day will send any one to an early grave. You may be able to follow a regime of this sort in growing years, but when full maturity arrives look out for trouble if you persist in this habit. Three light meals or two medium heavy meals daily will prolong your life and increase your efficiency mentally and physically. I eat but one hearty meal a day, and that is preferably taken at noon, though sometimes it is eaten in the evening. Occasionally I eat a light meal in the morning or evening, if I have a craving for food, though these light meals frequently consist of fruit alone or nuts and fruit with a warm or hot drink. But the main point that I want to emphasize is the necessity of avoiding the habit of eating by the clock—without appetite. Wait for a definite feeling of hunger. Let your stomach dictate your eating habits.